You know that wonderful feeling you get when you put your hand in your pocket and find forgotten money? I usually don’t find more than a dollar, but it’s still exciting. Today I was organizing my purses in the large, clear bag that I store them in and thought I would check each one “just in case” there was a President hiding out. 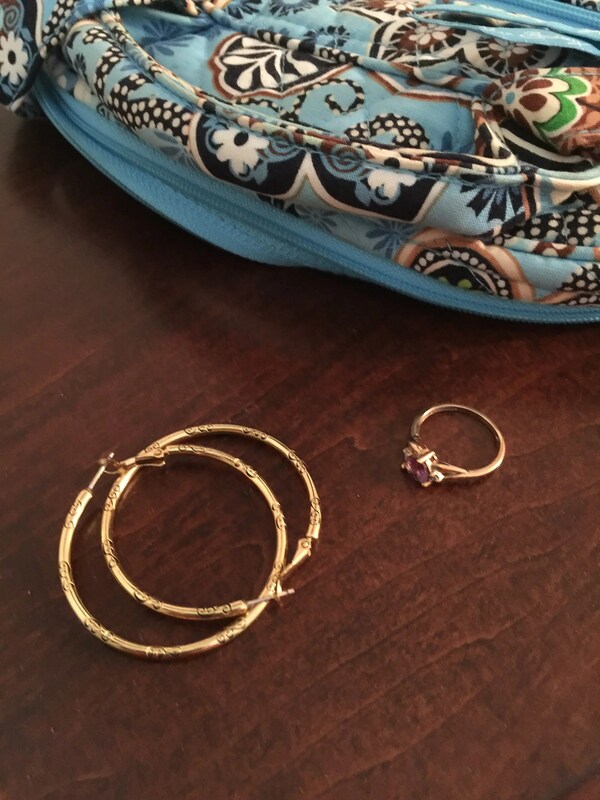 No money, but I found a pair of Brighton earrings and a gold ring tucked away in a small backpack. I have a vague memory of loaning the earrings to the daughter that owns the ring, but not enough of one to blame misplacing them on anyone but myself. Check your bags, Ladies! Who knows what you will find? With the kids off from school yesterday, today kind of feels like a Monday. I had a hard time remembering to put the garbage out this morning! When I woke up this morning, I discovered that the dog had gotten sick in the night. What a mess! I had to give him a bath before taking the kids to school. Not a fun start to the day, but thankfully Toby seems to be feeling better now. I’ll be keeping an eye on him today. Three of the kids went fishing with their grandpa yesterday. Unfortunately, they didn’t catch any fish. They had quite the little adventure running out of gas, drifting to a neighbor’s dock, and borrowing gas to get back home. Thankfully they weren’t stranded out in the middle of the lake! They actually had a lot of fun, I think. We have had the prettiest weather here the last couple of days. Right now the sun is shining, and there are even a few flowers blooming around the yard. Cooler weather is supposed to move in tonight, so we’ll see whether or not the flowers last a few more days. I think I’m going to get my boots out and wear them while it’s cold. I’m sure January lows in the 30’s and highs in the 50’s sound pleasant to my Northern friends, but that’s VERY cold for this Florida girl who is used to summer temps ten months out of the year. I hope you stay warm, wherever you are! Happy Veteran’s Day to all those who have served in our country’s military, both past and present. I’m thankful for the sacrifices made by these special men and women. It’s been a busy Monday for me. I had a speaking engagement this morning (thankful for that group of young ladies), then I made a quick trip to the grocery store (thankful for the money to buy groceries), and now I’m fixing to tidy up a few hot spots around the house (thankful for the family that makes the mess and for the strength to clean the mess up). I came across this picture of Shay and Bryn today. It was taken almost exactly nine years ago. Makes me want to cry. Just look at those chubby baby legs! Okay, no more getting sidetracked; the house won’t clean itself! Hope you have a fabulous (thankful) Monday! I’m hitting the road this morning to vacation with my mom and the girls. We’ve got a seven hour drive ahead of us on the first leg of our 15-day trip. I’ll share more when we reach our destination. If you think about it, please pray for us as I’m sure the interstate will be busy this holiday weekend. It’s been a little while since I’ve posted, so I thought I’d give a quick update. We’ve had a great summer. The kids have enjoyed staying up late and sleeping in. They all went to our church’s summer camp out in the woods. 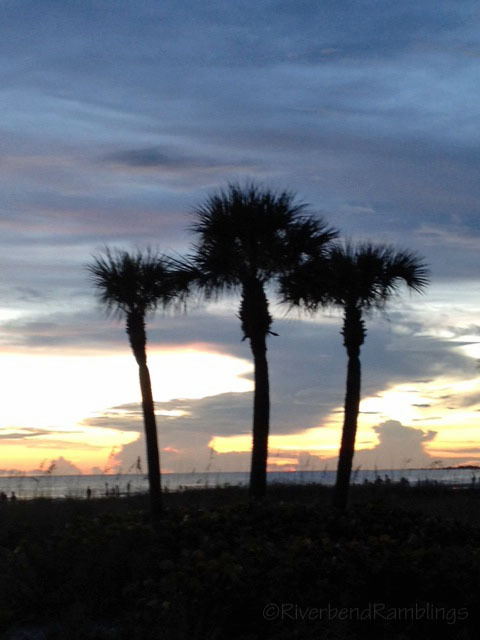 We spent the most relaxing week ever at a condo on the Gulf coast. I could have stayed there forever. I think my friends up north have over a month left of summer break. We start back to school on August 20, so the kids have just over two weeks left to be lazy. I actually won’t be going back to school with them. I officially hung up my principal hat at the end of July. I’m sure I’ll still have plenty to keep me busy, but I am looking forward to the change of pace. There are some really good back-to-school sales right now during Florida’s tax-free weekend on clothes and shoes. I have some $10 off coupons for Ko*hl’s and hope to find the tennis shoes for all of the kids there. Wish me luck! Bookworm and Curly Girl both did well at their piano festival, although we’re still waiting on their scores. It is feeling more like summer than spring, but we’ve still been getting a cool breeze in the evening which brings temperatures down into the 60’s. I hear thunder rumbling in the distance as I type. I’ve been planning our annual Mother’s Day luncheon, which is just a couple of weeks away. I’m really excited about this year’s guest speaker; she is a riot! My blogging friend Liesa @ Life by George recently hosted a giveaway, and I won! Liesa rushed me a package full of goodies. She did a great job of picking out some personalized items that were just perfect for me. I am thankful for good friends who encourage me when I’m having a rough day. There are 28 school days left until summer break. Happy 2011! I didn’t post anything during the Christmas holidays. It was nice to take a break from “everything” and enjoy time with my family. I hope you all had a wonderful Christmas as well. Best wishes to you for a very blessed year!